Slicing the ball is one of the most frustrating and common golfer mistakes. Slicing the ball is one of the most detrimental shots for a golfer, as it is frustrating and often leads to a bad score on a hole. And no matter their level of expertise, almost all golfers slice from time to time. It occurs most often with drivers, because the club head is larger and the shaft has a greater amount of flexibility, but it can happen with any club. Posture and stance go a long way in fixing slicing problems. The body should line up parallel to the ball, with the upper body and lower body staying as steady as possible on the backswing. On the downswing, start rotating the upper body to go with the speed of the downswing. Rotating the upper body too quickly leads to a severe slice. This is a technique specifically designed for amateur golfers who have slicing issues, but it makes sense from the standpoint of getting your body to feel the way playing golf should feel. Right before making impact on the ball, aim the club slightly to the left, all the while keeping your shoulders steady. As you get better at hitting the ball left, straighten out the swing to go down field. A golfer has less control over where to shoot the ball with a loose grip. With a tighter grip, the golfer increases the chances of placing the ball in the direction he aims. A tighter grip also puts more power behind the swing, which helps the ball to stay on course, while a loose grip will push the ball—and that can lead to disastrous results. The trailing shoulder should be as still as possible, because it is the one that helps stabilize the shots. If the shoulder dips, it will lead the arm to divert the angle of the shot, so keep it straight and you will see your slices diminish. Wayne Lin has played four years of golf at the collegiate level and coached junior competitors. He has written articles about golf for local newspapers and magazines. 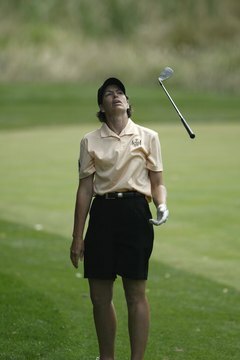 To date, Lin has played at over 90 golf courses across the United States and continues to compete in local competitions. He has a Bachelor of Arts in English from the University of Oklahoma.